We carry a full-line of Grain-free food. Produced in Italy! In nature, dogs almost exclusively eat meat and do not require a diet high in carbohydrates. Pursuing this philosophy, Farmina has developed the innovative line N&D Quinoa, which is a functional limited ingredient line formulated to meet the special nutritional needs of dogs. Each formula has over 92% protein from animal sources, Quinoa which is a functional super-food, and plant extracts with significant nutritional properties that are useful in restoring the health of pets. It’s helpful in the prevention of cardiovascular problems. N&D QUINOA DIGESTION A highly digestible formula for bowel health. With precious nutraceuticals such as: Fennel: Promotes the absorption of nutrients and reduces fermentation which diminishes intestinal gas. It is also a source of flavonoids that provide an antioxidant action. Mint: Stimulates gastric activities which promotes digestion. It also has antispasmodic and bracing effects. Artichoke: Cynarin is present in artichokes which seems to have beneficial properties for the liver. The artichoke is also rich in antioxidants. N&D QUINOA SKIN&COAT A special formula for food sensitivities, useful to restore and maintain skin and hair wellness. With precious nutraceuticals such as: Coconut: Rich in Zinc, essential elements to protect the skin; copper, iron, potassium, magnesium, phosphorus and sodium. Its high content in vitamin B and C relieves stress and helps with weakness. Turmeric: Provides important effects on skin repair and is rich in natural antioxidants. N&D QUINOA WEIGHT MANAGEMENT A special formula to restore the ideal body weight of cats and dogs. It also helps animals with a tendency to become overweight to maintain an ideal weight without giving up a delicious meal. With precious nutraceuticals such as: Broccoli: A low-calorie food but rich in natural antioxidants, minerals (calcium, iron, phosphorus, potassium) vitamin C, B1, B2, fibers that promote satiety and help intestinal flow and thanks to high sulforaphane levels it provides a protective action against intestinal cancer. Asparagus: With a diuretic effect it is a co-helper against urolithiasis and has an active role in diminishing eczema. Rich in asparagine, important in proteic synthesis, rutin to reinforce small vessels walls, folic acid, manganese and Vitamin A, with a benefic effect on skin and muscle ligaments. 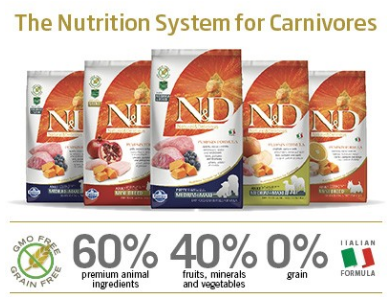 Our N&D Pumpkin Formula is a new Grain-Free line born in Italy with unique nutritional characteristics: Long-lasting vitamins: Thanks to our vacuum coating system, a unique technology that allows us to include vitamins at a lower temperature after the cooking process, ensures the entire nutritional value of the vitamins we use are still bioavailable in our finished kibble. Packaged under a Protective Atmosphere: By introducing Nitrogen (a gas naturally present in the air) into our bags of kibble we can remove any oxygen, (which is responsible for the process of oxidation) that is present. This technology is widely used in the human food industry because it preserves all of the nutritional features of food while keeping it as fresh as if it was just cooked.